The term "Southern-style ribs" may appear to allude to a region-specific type of barbecue sauce or a certain mixture of spices, but actually refers to a cut of pork . 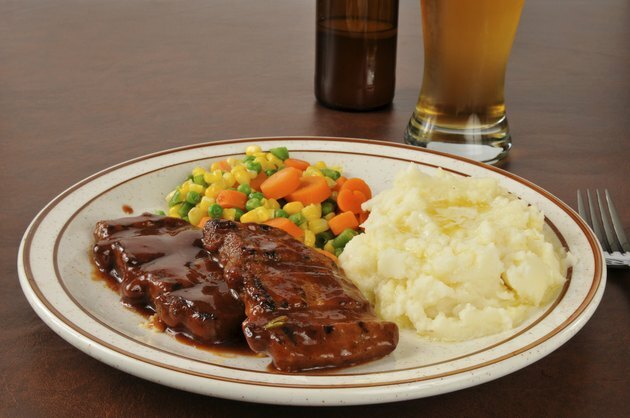 Southern-style ribs, also referred to as "country-style," are meatier pork ribs that are cut from the pork loin. These are the type of ribs that are eaten with a fork and knife and most often roasted or baked. True southern-style side dishes to accompany the ribs include cole slaw, hush puppies or baked beans. Let the boneless pork ribs come to room temperature in their packaging, approximately 30 minutes, before cooking. Season the boneless ribs with your desired herbs, spices, rub or sauce. Coat the ribs thoroughly. Place the pork ribs into a baking dish, single layer, and cover the dish with aluminum foil. Bake the ribs in the oven for one hour. Uncover the ribs, turn them over using tongs and season the side of the pork now facing up. Place the foil back over the baking dish and cook the boneless ribs for another 30 minutes. Test the pork ribs with a meat thermometer. The internal temperature should reach 145 degrees Fahrenheit, according to the USDA. Let the boneless pork ribs rest for five minutes before enjoying so the juices can redistribute. Alternatively, slow cook the pork ribs in the oven at 200 degrees Fahrenheit for three to four hours, turning the ribs every hour. Marinate the pork ribs in the refrigerator for two to three hours before cooking. Use Texan or southern-style barbecue sauce for traditional pork rib flavor. Do not eat undercooked pork due to food-borne illness.